A section of the Steve Jobs Apple-1 spec sheet, with two Polaroids. 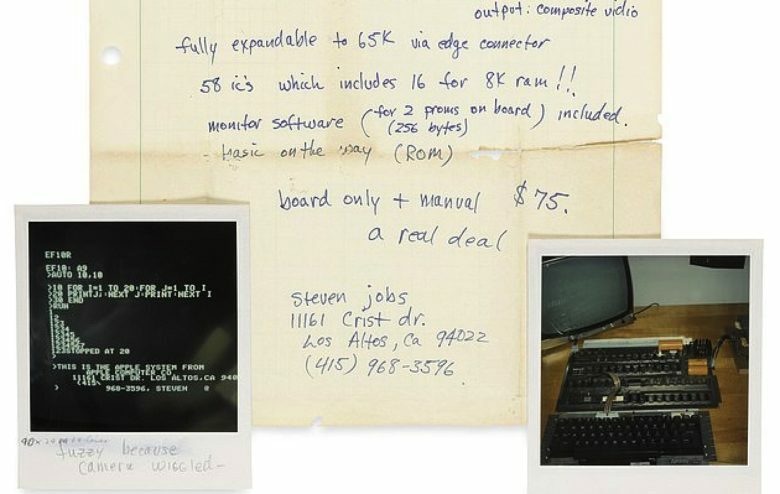 A vintage handwritten spec sheet in which Steve Jobs called the Apple-1 motherboard a “great deal” has failed to sell at auction. The document, written in the mid-1970s, was up for auction as part of Bonham’s “History of Science and Technology, Including Space History” collection. Its asking price was $60,000. However, the bidding “only” reached up to $28,000, thereby failing to meet its reserve. A couple of historical Apple items did sell, but for less than expected. Alongside the Jobs handwritten spec sheet, an Apple-1 computer and Apple Lisa also went under the hammer. The Apple-1 was expected to reach $250,000 – $350,000. While expensive, that is significantly less than the $905,000 that one Apple-1 sold for in 2014. At yesterday’s auction, the Apple-1 sold for a slightly disappointing $237,500. The Lisa, meanwhile, was expected to hit the altogether lower price of $30,000 – $50,000. It sold for $31,250, within the price target, but at the lower end. A recent report suggested that Steve Jobs’ autograph is one of the most sought-after from collectors. Today, an early edition of Macworld Magazine, signed by Jobs goes up for auction, with an asking price of $10,000. Will it get the amount of money its seller hopes for? At least judging from this most recent auction, the market may have been flooded for Apple memorabilia. The biggest leap came after Steve Jobs’ death in 2011, when interest in Apple collectibles saw a surge of interest. Still, that might make this the perfect time to score some (relatively) low-priced items for the future.